David Toland at a Thrive Allen County event. He served as the economic development group's CEO and critics have used that to attack his nomination to be the next Kansas secretary of commerce. Grievances generated by policy and personality clashes in a southeast Kansas community have spilled onto the statewide stage in the battle over Democratic Gov. Laura Kelly’s nominee to head the state Department of Commerce. David Toland often found himself at odds with Virginia Crossland-Macha when he was the CEO of Thrive Allen County, a community health-improvement and economic development organization based in Iola. Crossland-Macha is the daughter of the late Ivan Crossland, founder of Crossland Construction, one of the nation’s largest general contractors. She is also the newly elected vice-chair of the Kansas Republican Party and she’s been working behind the scenes to scuttle Toland’s nomination. The intensity of the battle has rattled many in the town of approximately 6,000, said John McCrae, a former mayor and current president of Iola Industries, a business development group. “They’re kind of stunned that Virginia is leading the charge against the hometown boy who has done so much and so well,” McRae said. They’re also stunned, McRae said, that abortion has now become an issue in the confirmation fight that was already complicated by Toland’s flippant jibes at prominent Republicans. On Monday, Kansans for Life, the state’s most powerful anti-abortion organization, charged in a letter to senators that Toland was unfit for the commerce post because of his “ties” to the late Wichita abortion provider George Tiller. “It is unconscionable that anyone wishing to sit in the governor’s Cabinet would be part of honoring the legacy of an individual who took so many innocent lives,” KFL said in the letter. The connection consists of two small grants Thrive Allen County obtained from a memorial fund established after Tiller’s murder in 2009. Neither paid for abortion services. The second was a $10,000 grant awarded in 2018 that Thrive immediately transferred to the SEK Multi-County Health Department based in Iola. “It arrived one day and exited the next,” said Lisse Regehr, Thrive’s incoming CEO. The money funded a health department program to curb the incidence of premature and low-birth-weight babies. Crossland-Macha didn’t return multiple calls or texts seeking comment. But she said in a recent email to McRae, a longtime friend, that she opposes Toland’s politics and his attempts to punish her and other Iola business owners who spoke out against Thrive initiatives. Thrive’s successful campaign to raise the legal age for purchasing tobacco products in the city from 18 to 21 was among the examples of recrimination cited by Crossland-Macha in the letter. She said the truck stop that she and her husband, Larry, own lost $100,000 in sales during the first month of the new policy. 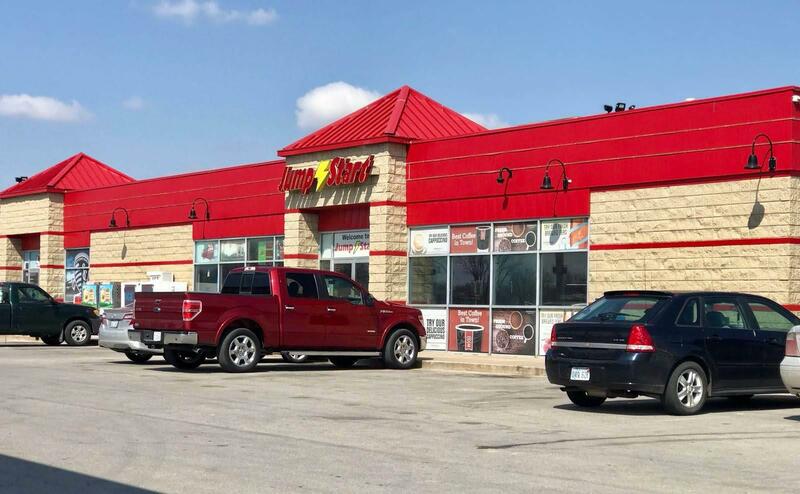 The truck stop owned by Virginia Crossland-Macha, a Kansas Republican Party official, that lost business when Allen County raised the age for tobacco purchases. At one point, a harassment campaign directed at Toland prompted him to call the Iola police. They questioned a handful of people who Toland suspected were producing and distributing leaflets attacking him and his family. The investigation didn’t result in any charges but it did stop the harassment, according to the report. McRae, a lifelong Republican who served 12 years as mayor, said he believes most Iola residents who know something about the battle are backing Toland because of his work to transform the community. Under his leadership, McRae said, Thrive facilitated public-private partnerships to develop a new apartment complex, recruit a new grocery store and build miles of hiking and biking trails. The Robert Wood Johnson Foundation noticed and awarded Allen County its Culture of Health Prize in 2017. “It’s been absolutely remarkable,” McRae said. Crossland-Macha has a different view. “Mr. Toland’s version of economic development has displaced local small businesses and jobs in Iola,” she told The Topeka Capital-Journal. Crossland-Macha and various companies under the Crossland Construction umbrella contributed $52,000 to the political action committee of the Kansas Chamber shortly after Kelly was elected governor. The Chamber mostly backs Republican candidates. McRae said politics are at the root of the battle over Toland’s nomination. “As a Kansan who supports whoever our governor is, I’m sick of it,” he said. Some of Toland’s problems with Republicans also come down to political missteps. In a 2018 social media post intended to draw attention to a sleep study, Toland joked that former Republican Gov. Sam Brownback and sitting GOP Sen. Caryn Tyson kept him up at night. Even so, Tyson said, other factors will determine her vote on whether to confirm Toland to Kelly’s cabinet. “It would be nice to have some representation from southeast Kansas,” she said, emphasizing that she hasn’t yet made a decision. Sen. Dennis Pyle, a Republican from Hiawatha, said if the vote had occurred Monday, he would have voted for Toland’s confirmation. Then came objections from anti-abortion activists. Meanwhile, Kelly’s office orchestrated letters of support for Toland from across the state. Before returning to his native Iola to take the helm at Thrive Allen County in 2008, Toland directed planning for the mayor of Washington, D.C., and later headed development and planning for a real estate firm that specialized in transforming blighted areas of the city. By all accounts, the vote on his confirmation, expected next Monday, will be close. Thrive Allen County is supported by several regional health foundations that also provide funding to the Kansas News Service. In a live broadcast from the south steps of the Capitol, Steve Kraske and Jim McLean hosted discussions about the political priorities of Kansas' 48th governor as she took her oath of office. State lawmakers and political watchers opined on her chances for turning her Democratic Party platform into law, and how hard a fight the Republican legislature will put up when it comes to Medicaid expansion, school funding and more. Then, Gov. Laura Kelly gave her inaugural address. Kansas Democratic Gov. Laura Kelly’s Medicaid expansion proposal is a retread. It’s virtually the same bill that former Republican Gov. Sam Brownback vetoed in 2017. An attempt to override that veto in the House failed, but only by three votes. Democratic Gov. Laura Kelly has sent a tax relief bill down in flames, taking her veto pen to the measure she says would wreck the state budget. But, as a priority for Republicans, it could remain in play for the rest of the legislative session and rise from the ashes.